We spent day two of the Iceland leg of the tour on the Snaefellsnes Peninsula on the West coast of the country. This basically a ring road around the coastline of the peninsula surrounding a large glacier. The weather looked to be horrible over breakfast but 30 minutes into the drive it became nice and stayed that way for the duration except for a few short showers while we were driving. The only thing we didn’t get to see was the glacier unfortunately. 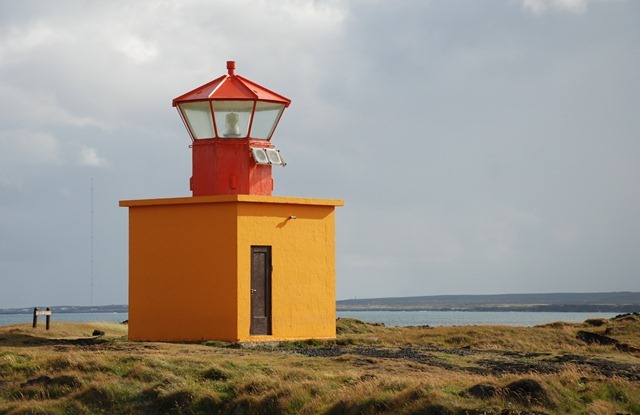 We started by driving west from Grundarfjordur, past Olafsvik to the most Western point, where we took a dirt road out to a couple of lighthouses and an old Viking’s grave. Next was a drive South down the West coast where we hiked into a small volcanic crater (very cool, but very windy). After that we actually drove into another volcanic crater. Mind you, these are small volcanoes but driving into one is still quite interesting. The next stop was another hike, this time along a very famous stretch of black beach called Dritvik that is reportedly the roughest coastline in Iceland and the sight of many shipwrecks. In fact, one of the first things we saw was the wreckage of a fishing vessel from the 1940s that was strewn all over the beach. It looked more like a plane crash given how small the pieces were – not a good day for those folks. Also on the beach in you can find four "lifting stones." These were the actual stones used to test men who wanted to work on a fishing boat back in the day. Before the men where hired they had to prove their strength by lifting stones, each of which weighs more than the previous and is named accordingly: Amlodi – 23 kg (Useless), Halfdraettingur – 49 kg (Weakling), Halfsterkur – 140 kg (Half strong) and Fullsterker – 150 kg (Fully strong). I gave it a shot and am proud to report that I am not useless, but merely a weakling. Later we saw a larger guy trying the 3rd one and not only did he fail, but I think he will be at the chiropractor’s office tomorrow. We hiked above the beach at Dritvik for quite some time and it was stunning. Seeing the old fishing village (at least some remains) was very cool and the black beach was especially dramatic. We tried to find an old Labyrinth that was created by these fishermen out of boredom (they had to live here for 3-4 months at a time), but eventually gave up to hunt for lunch instead, which proved equally difficult. Hard to find restaurants when there are barely any people in the country. Eventually we settled for burgers at a gas station, which only cost us our first born children. Did I mention how expensive this place is? Ty mentions in his blog that he needed to go to the bank before dinner to get a loan. Agreed. Didn’t this country go bankrupt within the last year? I guess we are paying to get it back on track, and quickly at this rate. After lunch and buying gas (btw – you should never complain about gas prices in the US as we paid something like $6-7/gallon here) we headed straight North to Stykkisholmur which is not only the ferry terminal for passage to the North Fjords, but also the sight of a festival this weekend… Danish Days! Huh? 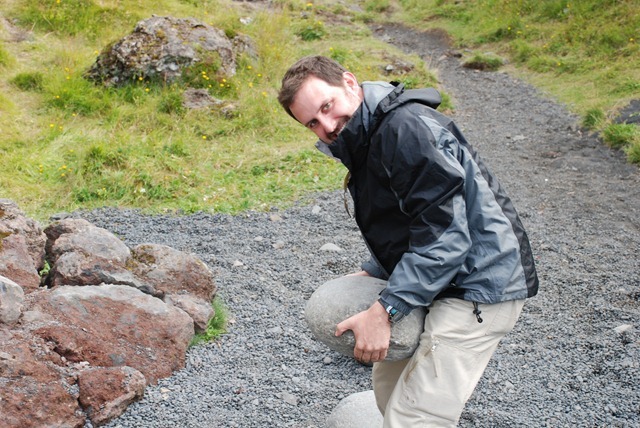 We went to see how Icelanders have fun on the weekends and I for one was not disappointed at all. We arrive in this much larger, but still tiny town on the North coast of the peninsula to find the festival in full swing. 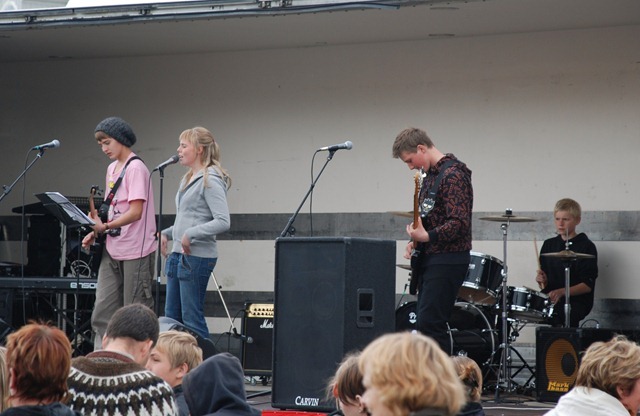 About 400 people all gathered in a park watching a band play Guns & Roses and other covers – we could hear them from the parking lot but when we finally got a look at them we were surprised to see that they were about 13-15 years old (and we think the drummer might have been about 12). Excellent start. After walking around the town a bit we returned to find 4-5 older guys in crazy wigs holding either and auction or sale of very random items like a cheap used entertainment center and a washing machine. Very confusing, but very funny as well. Would have helped to understand Icelandic (or was it Danish?). Following this event, we returned to our hotel in Grundarfjordur where the owner of the hotel (who had recommended this festival that morning to us) proceeded to tell us there was a roaming gang of guys who had randomly been beating people up (quite severely) for no apparent reason, including the night before where the festival was being held. Funny that she didn’t mention it before we left. Ugh. :) Oh well, back at the hotel safe and sound. Rounding out the day, I went for a long walk toward some big waterfalls but failed to find a path to them (added photos to the albums section) and then we went to dinner at “Kaffi 59,” a small restaurant here in this tiny town (one of three if you count our hotel). Now back to get some rest – tomorrow is our last full day of the trip! We’ll be heading into Reykjavik for our last night, then it’s off to Seattle on Monday…. The photos of Iceland look amazing visually. I wonder if your $$ go further in Iceland – wasnt it where the GFC hit hardest? OK, joke\’s over….time to come home…. :) I can\’t wait to see you in Seattle! One more day!